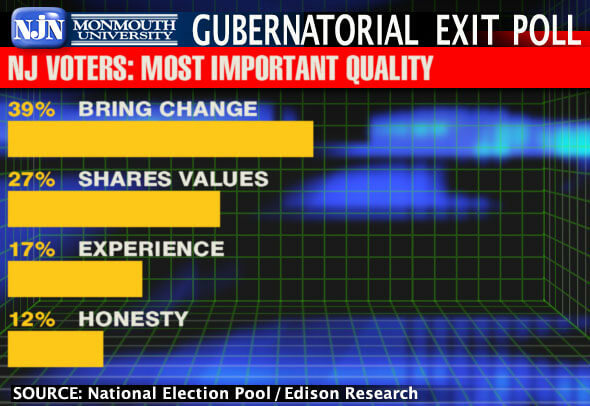 Wednesday, Nov. 4, 2009 at 12:15 a.m.
What personal qualities do New Jersey voters want most in a governor? According to the exit poll, 39% were looking for someone who can bring about needed change, 27% preferred to vote for someone who shares their values, 12% wanted somebody honest, and 17% say experience was the most important candidate quality in their vote today. Among voters who named change as their most sought after quality, 67% voted for Chris Christie and 7% voted for Daggett, while 26% stuck with incumbent Jon Corzine. Not surprisingly, Corzine won an overwhelming 82% of the vote among those who said experience was the quality that mattered most. “In a race where the incumbent’s job approval rating has been anemic, many voters say they wanted a change candidate. By comparison, in last year’s presidential race, 37 percent of New Jersey voters said that change was the top quality they were searching for. Obama won that race and Christie won this one,” said Patrick Murray, director of the Monmouth University Polling Institute and exit polling analyst for NJN News and Gannett New Jersey.